When I put this up on Instagram last week I never imagined it would be so popular. It is the simplest yet tastiest recipe I have made in quite a while. 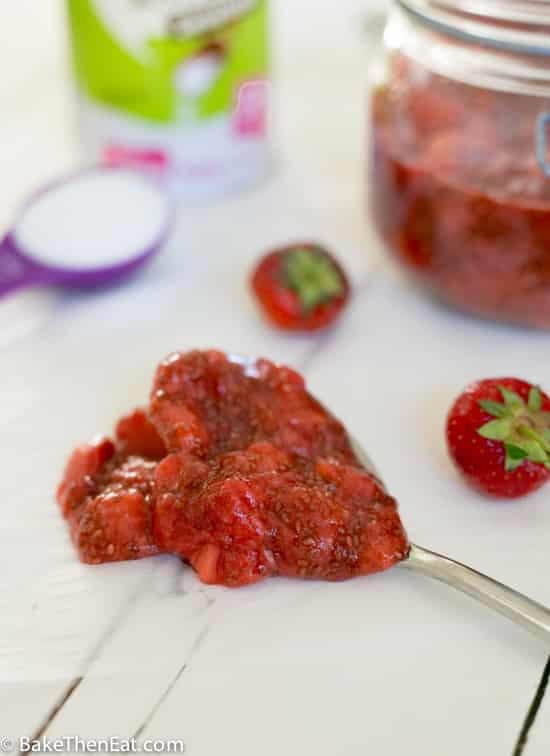 Three simple ingredients and 5 minutes of your time will give you this absolutely perfect 5 minute Chia Strawberry Fridge Jam. With strawberries in abundance at this time of year, it’s easy to overstock the fridge a little. I have been guilty of it once or twice so far this year. They are just so sweet and tasty I just can’t help myself. But sometimes I just can’t get through them and this recipe is perfect for preserving those sweet fruits for another week or two. 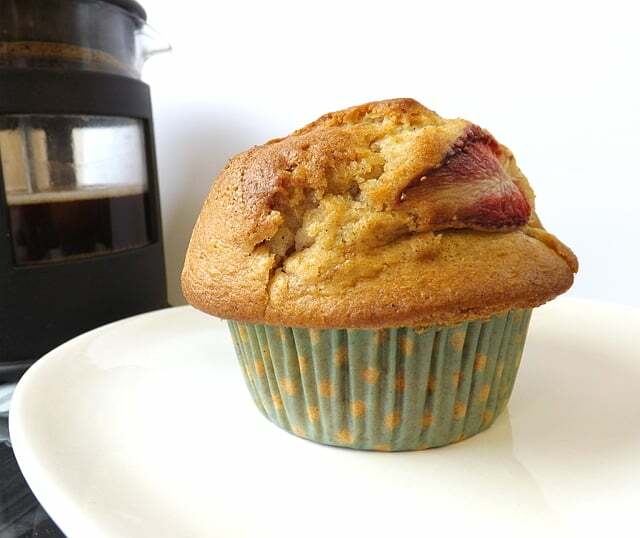 Slightly over-ripe squishy strawberries are perfect for this recipe, they don’t need to look perfect by any means. As you are going to mash them down in a pan with a small amount of sweetener. I used Natvia, with whom I work with on Instagram, its zero calories and completely natural which I love. But by all means, replace with your own prefered sweetener. This is not a sales pitch! I never really use these babies enough. They are packed full of so many good things, but I always forget to use them more often. This recipe is perfect for them. Their natural ability to go all jellified makes them perfect for this chia strawberry fridge jam. 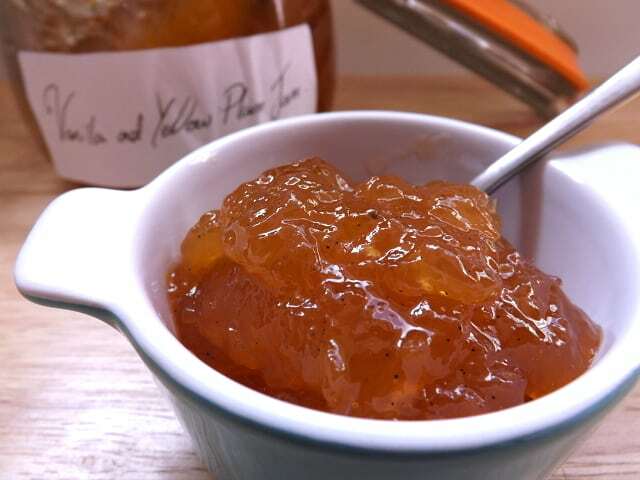 It helps to naturally thicken the jam without having to either add pectin to thicken it or cook the recipe like a proper jam. Although just a small warning, because this is not cooked like traditional jam it won’t keep like jam. Once made 2 weeks is the maximum shelf life, that is why I have made a small batch as its easier to consume within that time frame. Though, to tell you the truth I went through this batch in 6 days. It tasted just too good! 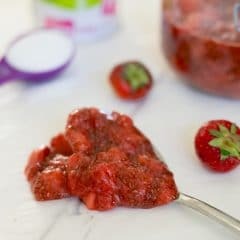 This Chia Strawberry Fridge Jam is so easy to make there is no excuse not to make it next time you have far too many strawberries in the fridge. 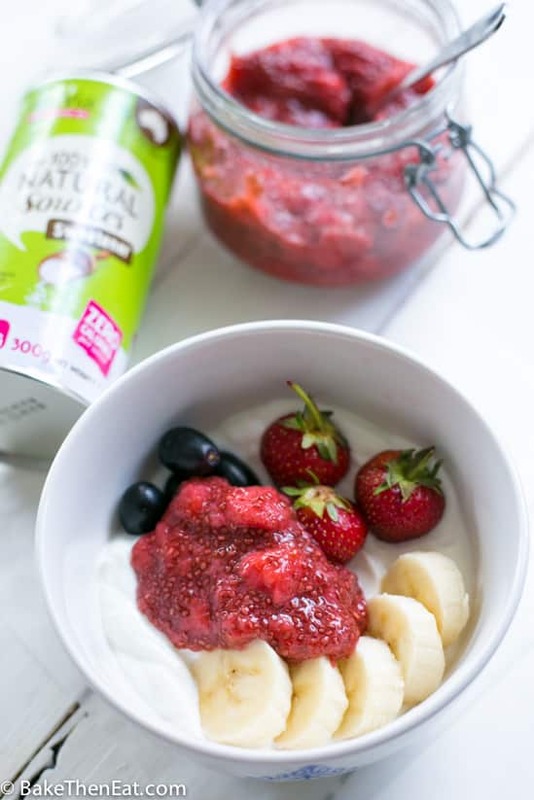 5 minute Chia Strawberry Fridge Jam is a simple and quick jam to make and is perfect to serve with yoghurt, oatmeal or on fresh crusty bread. Hull your strawberries and chop them into quarters. Place them in a small pan along with your sweetener and on medium heat, gently mash them up as little or as much as you like, to your personal liking. After 3 to 4 minutes take the pan off the heat and stir in the chia seeds. Leave to cool slightly for a few minutes and then decant into a clean sterilised jar. Once at room temperature place in the fridge and use a needed. I used Natvia 0 calorie natural sweetener to help sweeten this jam a little more and keep it sugar-free. I’ve seen chia fridge jam around the different blogs, and have always wanted to make it. Only 10 minutes?? I really don’t have any excuse! Such a great idea! I love adding chia to my yoghurt. Thank you for this quick recipe! I, too, saw this recipe on your Instagram and was intrigued. Homemade strawberry jam is the BEST! And what a quick recipe! Thanks, Brianna. My favourite thing about this recipe is it only takes 5 minutes. I am such an instant gratification type person! haha yes, I am definitely guilty of over-buying any and all berries this time of the year! You are not alone! 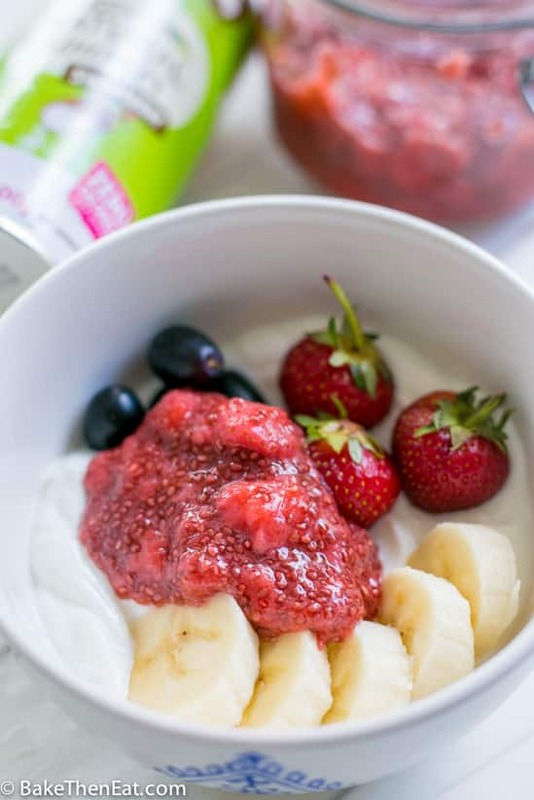 Love chia jam – this looks delicious! I’m so happy to have discovered chia seeds! what a tasty use for them! Thanks, Heather. Its so easy to make and I am sure you will love it. You’re welcome Priya 😀 Thank you! Emma this jam recipe sounds amazing. I have never made jam before. With a simple and quick recipe like this, I really don’t have an excuse now. I have all the ingredients in my kitchen and would love to try it out this weekend. Thank you for sharing…have a wonderful weekend. Such a great idea! I love adding chia to my yoghurt but haven’t done anything more with it than that. I’m guilty of having too many berries in my fridge a LOT! Thanks, Liz. I think we are all guilty of having too many berries in the fridge during the summer. You are reading our minds. 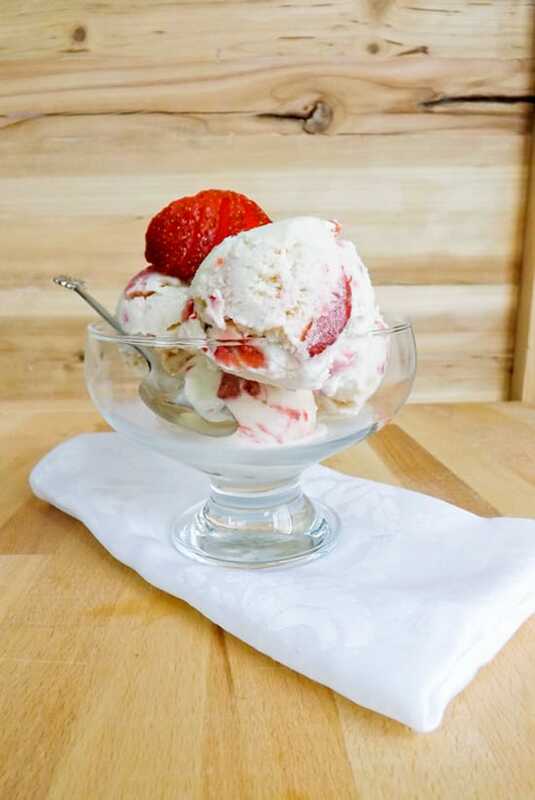 When it is strawberries are in season we love getting them any way we can. This jam would be fabulous on top of one of your delicious scones! I have seen chia fridge jam around the blogosphere for some time now, and have always wanted to try it. Only 5 minutes?? I really have no excuse! Except for I just used my squishy, little overripe strawberries and am leaving for Vancouver tomorrow. When I get back, I’ll try it for sure! This looks terrific — colorful, tasty, easy. What more could one want? Inspired recipe — thanks. I’ve never worked with chia seeds before, but this has me intrigued! 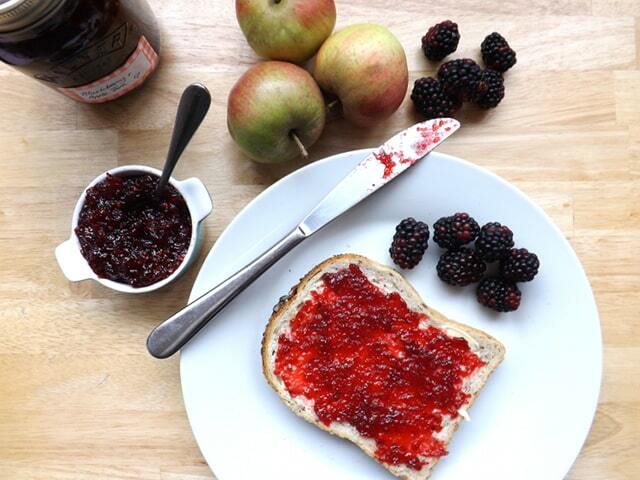 My favourite way to prepare a healthy and delicious jam-like spread! That’s a very delicious breakfast or dessert! Interesting! I didn’t know about chia seeds, and how they act like pectin. Honestly, a small batch of jam is best for me, especially without kids around to help eat it! I too find small batches of jam are the best for me as well. There are only 2 of us in the house and large batches tend to go off. Chia seeds are great for absorbing liquid and making things become more like a jelly/jam like in substance.